A recently released patch for Madden 16 altered some of the scouting rules, so I redid the analysis. So far it has held up pretty well--a few positions got harder to project, a few got easier. One of my specialties as an engineer is measurement systems. Anyone in this field will tell you that the hard part is balancing "false alarms" versus "false acceptances." Take the smoke detector in your house, for example: make it too sensitive and you'll never miss a fire but you also will get a false alarm every time you burn the dinner; make it not sensitive enough and you'll have no false alarms but you might have false acceptances, where you say everything is ok when really there is a fire. I'm dealing with the same issue here. If I make it perfect on predictive power (so that everyone you draft is a 78 or higher player), then you will "miss" a lot of good players; if I make it so you don't miss any good players, then you will falsely accept bad players. I've tweaked it to my preference, but if you want to tweak it differently, then do some experiments and see what fits you best. Below, the term Predictive Power means, "how likely it is someone that this list says is good will be 78 or higher overall". The term Missed Opportunities means "how many 78+ level players this list will not identify." Pay attention to the "player types" in your Coach Settings. I run a 4-3, and recently drafted a 4-3 OLB who during the draft it said was an 86...yet when I see him on my roster he is only a 71! The reason is that I had the OLB set up as a pass rusher type, and he is a Cover-2 type. So I went into Coach Settings and changed player type for the OLB to be Cover-2 and all is well. One good strategy is to make one OLB a Cover-2 and one a speed rusher. Make one WR a speed guy, one a possession guy, one a red zone threat. Make each offensive line position and defensive line position a different specialty. Then when you draft a player, you can simply adjust the roster to put him in the position on your team that matches. If you make all your OLB preferences the same, then only certain types of OLB will work for you. If you enjoy this - please read other things on my site! I apply the same level of nerdy thoroughness to my approaches to religion and politics and philosophy, and I think / hope you will find it useful and thought-provoking! Throwing power: A- or higher. Do not scout receivers until last, because you will want to use the Combine to help cull out players and not waste scouting points. Like receivers, this one is very tough to pick. This one it seems that I'm being overly critical here; a missed opportunity of 40% means I could probably adjust this to be better. But frankly I have just not had much luck here so I'm not trying much more. I just rely on Free Agency for this role, or get OLB and DT and then change their position! Along with HB and CB, this one is a star of my analysis system. I'm always stacked here and can often use them for DE. The lower predictive power here is because often you end up with C+ as the third score but you aren't sure if Finesse Moves is also C+, making it hard to know what to do. Don't waste your draft picks. Within 5-6 seasons of this, your team will be absolutely stacked as well as very deep, and cheap since so many starters will still be on your rookie contract. I am a huge, huge HUGE Madden franchise fan. It is the one video game I cannot wait to have each year, and it is fantastic. I especially love (because I'm a loser/nerd/whatever) to build franchises. The key to a successful franchise, long-term, is scouting properly. Through the draft you can add depth and some starters far cheaper than you can through the free agent market; plus they will be in their peak years when you have them, rather than aging as high paid veterans. Filling your team with recently-drafted players also means that you have more cap space to sign the stud free agents or lock up high performers to long-term deals. The problem is that scouting is often hard to do at a high level of accuracy. 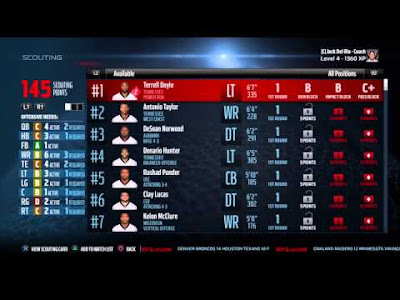 Madden 16 is particularly clever and has the best scouting method in any of the games thus far--and the hardest to "crack" and thereby find hidden gems late in the draft. Lucky for you...I'm a huge nerd, and I've already cracked the code. What follows is a system which--though not full proof--is far better than anything else you will find online. I tested this against other online advice and found that this system is between 29% and 95% better, statistically, than other systems. How did I do it? That is partly proprietary, partly embarrassing. Basically, I unlocked every attribute for every player by recording the values in a spreadsheet and then restarting without saving, thus allowing me to have a full spreadsheet of the entire draft. Then I had it autodraft, and added in the output to my spreadsheet. Then I put my engineering statistics to work, doing a multiple linear regression model for each position to predict the outcome. This allowed me to narrow down and create the following "rules" for scouting. Follow these rules, you succeed. Period. For example, in my most recent draft a few minutes ago, I was able to get: 1st rd: WR 79 overall; 2nd: C 81 overall; 3rd: DT 79 overall; 4th: DT 75 overall; 5th: CB 78 overall; 6th CB 78 overall; 7th FS 66 overall. The only player who wasn't worthy of starting by year two was my 7th round pick. Scout each week, don't wait until year end. In Madden 16, you lose half your scouting points each week. If you spend them each week and have the 'scouting' upgrade package as a coach, this means you have roughly 4000 scouting points to spend each year. If you wait until the season if over you will only have about 300 to spend. Obviously this is a 93% advantage to doing it weekly. Use the Watch List. As you go through the following positions, any time a player is "draftable" or "passes" the tests below, you should hit triangle (on PS4 version) to add them to your Watch List. That way during the draft you can simply hold L2 and toggle to your Watched players, and then you'll always have your list of passing players. It will make tracking them much easier. Projected Round and Overall Grades are USELESS--ignore them. My linear regression analysis showed generally an R-sq value of less than 10% for both projected round and overall grade--meaning that there is a TON of variability within those guidelines. The only value is that the "undrafted" projection is accurate--my analysis showed that there is less than a 1% chance that a player ranked as "projected round: undrafted" will be of a quality worth making your team. It's not worth spending even 1 scouting point. So in each of the below, I consider a position "fully scouted" when you have scouted every player who has a projected round above from 1-7; I ignore the undrafted players completely. Other than this, though, the grade and round are weakly valuable at best (exceptions noted below). (I love this because it mimics the uncertainty of real scouting in football). Quarterbacks (TEST: TPwr >A-, Top3Avg > B+). Start with the QB position. For QBs, you want at least a throwing power of A- and if you average the three attributes together they must be at least a B+. So for example, if you are unlocking a player and you get throwing power of B+, you should stop immediately. Do not waste any more points on him. He failed the test. Also if you are unlocking players and you get TPwr A- and then unlock the second one and it is Short Accuracy C+, you can go ahead and stop. A- and C+ will never average to be a B+ or better. You want something like A-,B+,B to be the top three scores. Probability of good pick: 98%. Offensive Linemen (TEST: Run Blk B+, Pass Blk B-). After fully scouting QB position, go to your offensive linemen. You want to see a run block score of at least B+ and pass block of at least B-. Pass blocking will have the biggest impact on overall ability, but is more rare. If you can't get at least a B+ in run blocking he will not stand out from the crowd. Probability of good pick: 61%. Tight Ends (TEST: At least one catching skills is a B, Top3Avg > B-). When you have scouted all five offensive line positions, you can move to tight ends. With tight ends, you should ignore anyone who does not have at least a B in one of the three catching attributes (Catch, Catch In Traffic, Spectacular Catch). If he passes that test, then go ahead and unlock all the other attributes. His top 3 should average a B-. (So for example: B-, B-, C+ fails--the average is below B-). Probability of good pick: 72%. Defensive Tackle (TEST: Top3Avg > B-). Next up, begin scouting the defensive tackles, who are generally the most likely to have a deep draft on this list, but also it is rare to get a true stud (79 or higher). The problem is that those who are studs are statistically impossible to predict compared to the solid picks (73-78). But if you make sure their top 3 average is B- or higher, then you always know you have value at the position. Probability of good pick: 77%. Linebackers (TEST: Top3Avg > B). Linebacker will eat up a lot of your scouting points but it is worth it. Anyone who averages a B or higher overall is worth rostering. However, LB is one of the hardest positions to predict with the scouting in Madden 16. Choosing at random or using other online systems will give you a good LB pick about 30% of the time; our system increases that nearly double, but there are still going to be a lot of misses. Probability of good pick: 55%. Free Safety (TEST: Pursuit >C+, Top3Avg > B-). After fully scouting all linebackers you are probably in the second half of your season. Now let's move to FS. For free safety, scout until you can find out the Pursuit score. If Pursuit is at least C+ or higher, keep going. You should 'watch' the player if their top 3 average is at least a B- and their pursuit is C+. Probability of good pick: 69%. Strong Safety (TEST: Power >B-, Top3Avg > B-). Strong safety is the hardest to project. My system is not significantly better than any others; the linear regression could find no statistically significant predictors. It is slightly better to follow the advice here than flipping a coin, but not much better. Hit power above B- and top 3 average above B- is the best I can advise. Probability of good pick: 28%. Cornerback (TEST: Combine score > 7.0, MCov > B, Top3Avg > B). As you get to cornerback you are near the end of your season. Start unlocking them, only "watching" players with Man Coverage of B or higher and the top 3 average together for B or higher. Then after the season, when you get the combine results, come back and check these. Make sure and "unwatch" any player who was a B overall but ended up with a combine worse than 7.0. Probability of good pick: 95%. Wide Receiver (TEST: Combine score > 6.7, Top3Avg > B-, Grade 1). The wide receiver position is one of the rare ones where the overall grade is valuable. You only want to consider players here who have grades of 1 and whose top 3 attributes average to be a B- or better. In addition, when the combine results are in, you should eliminate any player who has a combine score below 6.7. Probability of good pick: 88%. Defensive Ends (TEST: Bench > 28 reps, Shed Block > B+). By now, you are definitely in the offseason, probably in the last 2-3 weeks. Check the combine results and only show interest in players of 28 reps or higher. For those, only 'watch' players with block shedding above B+. Probability of good pick: 51%. Running Backs (TEST: 40 yd dash < 4.60, Grade 2). Finally, it's time to scout the running backs. You don't want to bother wasting points on anyone who has a speed worse than a 4.60. After that, unlock all three attributes and anyone of Grade 2 or better has a high likelihood of being a good player. Probability of good pick: 64%. FB/K/P...NOPE. And no I didn't analyze fullbacks, kickers, or punters because they are basically worthless from a draft standpoint. There are always serviceable players at these positions for cheap on the waiver wires. Don't waste a pick on these. One final note: I know some of you are thinking..."51% defensive end probability...might as well flip a coin! Why bother following this?" Remember that I'm saying there is a 51% probability that the player you pick will be equal to or greater than 75 overall. There are maybe 2 defensive ends in any given draft of that talent, out of around 25 choices...meaning that by random chance you are only 8% likely to get the right one. The online suggestions I'm seeing suggested generally give you about a 25-30% chance. So a 51% chance that any DE you pick will be better than 75 is actually really, really good. Even the SS position--my worst predictor--is three times better than random chance and twice as good as most online systems.